Okay. Where is the best place to shop around Sarawak? Or particularly near Kuching. Everyone answered "Sarikin". Since before i went to Kuching, all of the people who have been in Kuching before always mentioning abou this place where the price is impossibly cheap. Is it true? So today, it is my first experience landing my feet to Sarikin. First impression "wow". 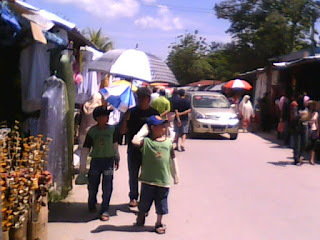 We stuck in a 2 miles traffic jam before reaching this rural place near the Sarawak-Kalimantan Border. Stuck almost an hour. Everyone going to this place i guess. Second impression "wow", no parking. This place is so crowded with people. I love something like this. When i go to somewhere on travelling, i did not like to go to a place where only i am alone going to that place. It is like i'm going to a wrong place. With such crowded place in Sarikin, I know that I am going to the right place. Third Impression, "damn". Its hot. Too hot. I don't believe when people say this place is hotter than Kuching town, but i do now. it is really hot. Dunno why. maybe it nearer to equator or something like that. So the shopping part. Is this place sell the most impossible price you ever seen in your life? No. It is just like an ordinary market with big big discount. How can i say it. If in Kuching, a same stuff would cost Rm130, in this place it will cost Rm100. Rm30 cheaper. But that is not impossible right. Telekung which everyone is saying "very cheap" is not that very cheap at all. It is cheap. I have to admit that. In my hometown, the price is still the same. maybe rm10 cheaper. And kain pelikat or sarong is not cheap. For the same brand in my hometown labuan, this place charge rm15, my hometown you can get it for Rm5. Rm10 if you did not know how to bargain. What about other stuff? Clothing? yeah, this place offer a very cheap price for that. But all the cloth is not up to my expectation. I would choose a good fabric rather than price. haha. So in the end, i end up buying 1 cowboys hats which i want to give to my father, 1 hat to my mother and a cap for me. 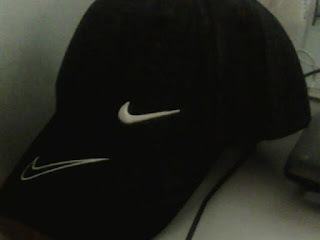 Nike cap with spectacular design, nice, original nike, only cost rm10. this is cheap. really cheap. that is why i bought it. haha. I'm trying to buy Tikar Kayu (wooden Mat), it is also very cheap here but, i don't bring enough money. Damn to myself. I also want to buy a Tudung saji, but i dunno how to put that on the flight later. So my last impression, this is shopping heaven. People who know how to shop really will enjoy this place. But, the temperature is too high here. Cannot stand for long. My skin got burn already. But i really enjoy this shopping session today. I have to close my eyes all the time because if i don't, RM50 in my wallet will disappear in less than 10 seconds. It did though. Anyway, one dissapointing thing is i want to buy a new wallet here. Original leather only cost rm15 something like that. Damn cheap right. But i found out that every wallet is an old fashion style. I'm trying to find a new one with zip around the wallet. Look like female wallet but design for man. I saw this is India Street Kuching, RM25. But in sarikin they did not have this kind of wallet. I asked them why they did not sell that one. They said, " Sorry bang, itu modelnya baru, kami pun mau mencari model itu. kalau di Indon sudah buat itu baru ada kami jual". Yes, every item sold here is made in Indon, and we are buying in Indon border. That is why this place sell thing so cheap. Lastly, please go this place. please. You would not be dissapointed. pesal zmn2 skng nie blog ko pnuh ngn bnda2 yg sgt tempting?!??! nice template. dah kemas blog ko ni. LOL. hey, Serikin la. but it was indeed a very nice place. nak dtg, bwk la at least 1K, baru puas! the next time im in Kuching, this is definitely a must visit place! try that Auntie lilly fried rice. Worth to buy. still, where's the best place to shop other than the country that made it? tu baru di perbatasan tu zaki, blom di negara asli dia.